I had grand dreams of a wonderful blog post filled with great pictures telling the story of our mini-vacation. 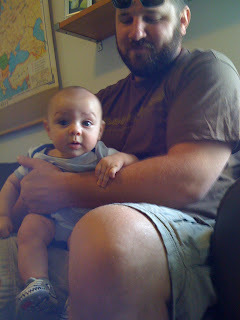 Pictures of Max playing with his new "aunties and uncles". Action shots capturing everyone sitting outside on the porch sharing a meal. Photos showing how hard we laughed playing post-dinner party games. Yeah, I got none of those. I was too busy living the moment to capture it. Our home away from home was GREEN but the perfect layout for 10 big people and one little one. The next day was spent at the beach. He also experienced the Atlantic Ocean for the first time. And in the end, all the excitement wore the poor guy out. It was the perfect getaway as well as the perfect "test trip" with Max. He was a total trooper and loved having so many people willing to cuddle. Brett and I also enjoyed getting the opportunity to see friends and have conversations that didn't revolve around poop and breastfeeding...although all the poor non-parents were subjected to way more of that than they probably wanted to hear. We have turned into *those* people and have no shame about it. Thanks to everyone there for being so accepting of a little, sometimes fussy kid. Everyone bent over backwards to accommodate Max. Brett and I really appreciated it. Also, thanks to the Cincinnati folks for making the significant others who didn't graduate with you still feel part of the gang. You may not have gotten ALL of the pictures that you wanted, but the ones you did get look like a great time. Max looks like he's worn out from all the fun! He is beyond cute!!! Looks like you had a great time! What a good baby!! Not all kids would go with the flow like that. And I love him snoozing with a book.